writing and unlicensed preaching. He was baptised into the Baptist faith in 1653 and by 1655 he had become a deacon and a successful preacher. In 1658 he was arrested for preaching without a licence. and despite warnings he continued to do so. He was then imprisoned in the county gaol at Silver Street, Bedford. in November 1660. There he was confined at first for three months, but again refused to conform and subsequently spent nearly 12 years (with the exception of a few weeks in 1666) until January 1672, when Charles II issued the Declaration of Religious Indulgence. While in prison he supported his second wife ( he remarried in 1659 following the death of his first wife) and four children by tagging laces. His book Grace Abounding was published in 1666. 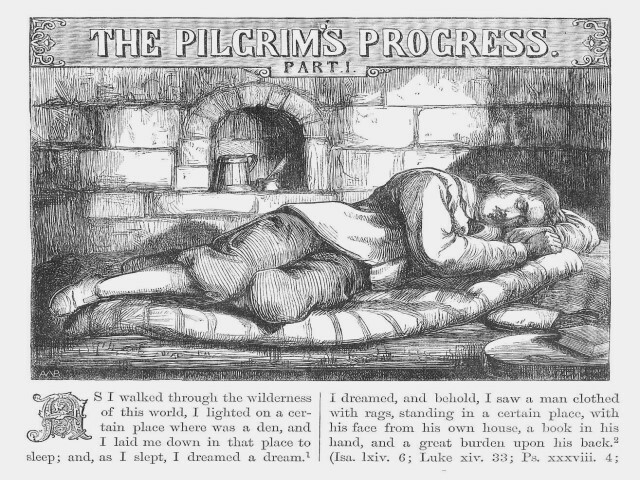 Pilgrims Progress which was written during this period, was published in 1678. On his way to London he caught a severe cold from being wet, and died as a result of a fever at the house of a friend at Snow Hill , London, on August 31, 1688. His grave is in the cemetery at Bunhill Fields in London. and door to door salesmen of the 17th and 18th century. a slow modem. If this is a problem please let me know.